Mende　Have you visited the area after the earthquake? Mende　It is just one year ago this month. They are starting to slow clear away the debris and reclaim the area. Saito　Yes. In December most of the debris was hauled away and two stop lights in the downtown area were erected. 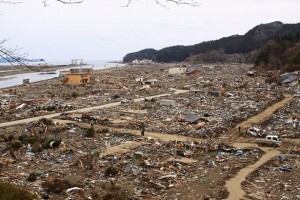 Seven months after the disaster in November there were still no street lights of any kind. This story made the new since it was so dark and a little scary at night. Is there anything we can do as lighting professionals? Mende　The city was devastated by a natural disaster that wiped out all power poles and even underground electrical wiring and ducts. It’s a tough situation to even get electricity to the area. However, solar panel mounted street lights don`t need any electrical wiring. It might be wise for the government to buy and issue solar power lighting to these areas. Even in times of a power outage, lighting with capacity to generated electricity from a natural source is a good backup plan. Saito　When we drove through the debris cover area, we only had the car headlights for navigation with a few house lights in the distance. I`m just an amateur, but I can`t help but think just laying down luminous, glowing maretials would be helpful. Mende　Unfortunately, it wouldn’t work. Mende　These types of luminous materials store up sunlight and when it is dark glow, but they do not last long and are very dim. This is an idea that most lay people first think of, but the costs are outrageous so the government can`t just go rolling out strips of it everywhere. It is not a good plan to secure lighting or safety in a city. Mende　When the city is in complete darkness, everyone`s mood also becomes dark and it is absolutely not safe for bicycles and such to have dark roads at night. For safety, even a little bit of reflective light from reflective sheets placed in strategic positions would be helpful. Headlights would reflect off of these and make it much easier for the driver. In the forests of India there are places with no street lights, but the trunks of several trees are painted white to make it easier on the driver and to avoid accidents. However, I think the darkened city of Rituzentakada needs a little bit of light to turn itself around. The luminous balloon plan entered in our inner office lighting competition is a good fit, but for starters I think solar power lighting is the best option. 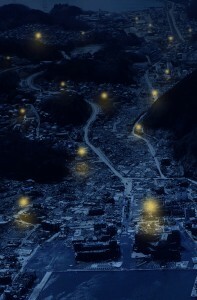 For example, if one fixture is say, \10,000, we could ask people, groups or companies for public donations to give the “Gift of Light” to the dark cities in the disaster affected areas. It could grow to an international collection! Saito　The Gift of Light! That’s a good idea!! Mende　From this disaster we have learned that we need to readjust our lifestyle and become more familiar with natural sources of energy. We have to think about the possibility of a zero energy lifestyle where you have to work by candlelight. A sound plan might be to generate one`s own energy with a single solar panel system. If energy runs out, Dad hops on a bike and pedals to generate more energy!! Saito　After the disaster, it was my secret dream to have this little town by the sea lit with warm light from my favorite lighting designers, LPA. Mende　Unfortunately, this is not our area of work, but we can help by volunteering. The government does the city planning with the help of experts in the field, but this is not always the case. If there is nobody to help the government officials, they will most often select the most efficient lighting that uses the least amount of energy, such as bright white LEDs. This is different than our work. You said you liked the warm light of LPA designers, this light is not as efficient, but warm color temperatures can make a small town feel warm and cozy. Lighting is not just about lux level calculations, especially during a reconstruction like this. How lighting effects people`s actions psychological and physiological is of great concern. If city planners just imagining the word warm, not bright or white, and the town atmosphere could be very different. The inner office competition “Proposals for Disaster-Relief Lighting” was a good thinking exercise, but most of the staff has not visited disaster areas to see for themselves, so most ideas where very fantasy-like. I would like to be more helpful in practical ways to the people in affected areas. Reconstruction is not an easy task, and rebuilding new towns and neighborhoods could take 5, 10 years, maybe longer. This might be our life work as lighting designers. 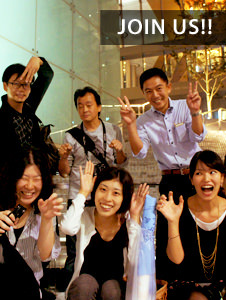 Saito　I also want to be of help and involved in rebuilding long term. 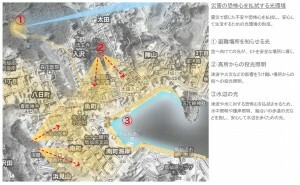 I just hope that the new towns will be warm and welcoming to the people affected by the disaster. Thank you for your time today.